There are no comments for 1855 Colton Map Of London. Click here to post the first comment. 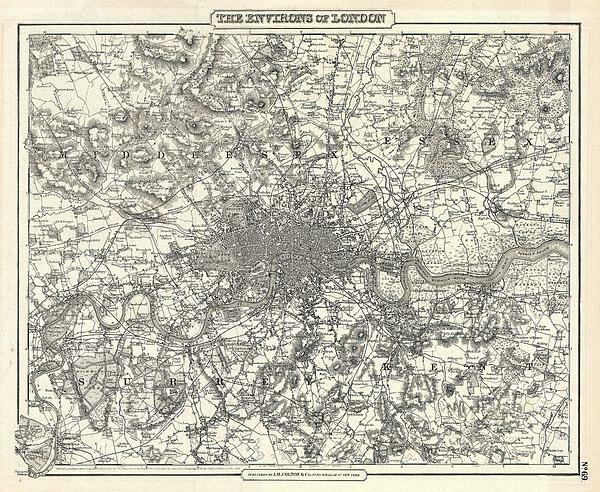 An excellent example of Colton’s c. 1855 map of London and environs. 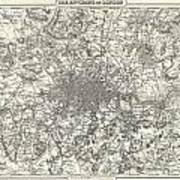 Includes parts of Surrey, Kent, Middlesex and Essex. Extends north to Southgate, east to Chadwell Heath, south to Kingston, Mitcham and Bromley, and west to Harrow and Isleworth - on a scale of 5/8 of an inch to the mile. The whole is beautifully detailed to the level of individual buildings, trees, canals and roads. 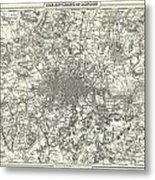 Includes topographical details as well as farms, parks, riverways, and swamps. This is most likely the one of the first maps of London to appear in an American atlas. 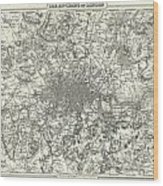 Copyrighted 1855, but most likely this was published for a post 1857 issued of Colton’s Atlas. Map no. 69 in the single volume the c. 1857 edition of Colton's Atlas of The World . Published from Colton’s 172 William Str. Office in New York.